I am still smiling about the rugby on Saturday night, when the All Blacks totally outclassed the Wallabies, with an emphatic win 22 - 0. There was much whooping and hollering at the television after that! The result wrapped up the Bledisloe Cup for another year and keeps that magnificent piece of silverware in the New Zealand trophy cabinet for the eleventh straight year. What an achievement for those mighty men. In other news, one of the world's most well-known astronauts has died. I was only three years old when Neil Armstrong became the first man to walk on the moon on July 20, 1969 but his name was one that the whole world came to know. No longer was walking on the moon the stuff of children's fairy tales; Neil Armstrong had shown it was possible. His first words as he stepped off that ladder have now become immortal: "That's one small step for (a) man, one giant leap for mankind". 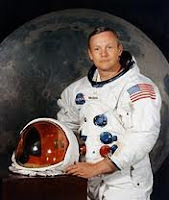 So to mark his passing at the age of 82, today's Music for Monday post is dedicated to Neil Armstrong. A quiet and unassuming man who became one of the most famous of all pioneers in space. May he rest in peace.